Nanomaterials in Rocket Propulsion Systems covers the fundamentals of nanomaterials and examines a wide range of innovative applications, presenting the current state-of-the-art in the field. 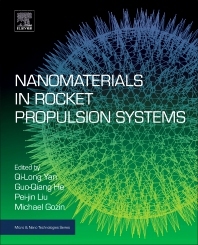 Opening with a chapter on nano-sized energetic materials, the book examines metal nanoparticles-based fuels, ballistic modifiers, stabilizers and catalysts as the components of rocket propellants. Hydrogen storage materials for rocket propulsion based on nanotubes are then discussed, as are nano-porous materials and metal organic frameworks, nano-gelled propellants, nano-composite ablators and ceramic nano-composites. Other applications examined include high thermal conductivity metallic nano-composite nozzle liners, nano-emitters for Coulomb propulsion of space-crafts, and highly thermostable nano-ceramics for rocket motors. The book finishes with coverage of combustion of nano-sized rocket fuels, nano-particles and their combustion in micro- and nano-electromechanical systems (MEMS/NEMS), plasma propulsion and nano-scale physics. Users will find this to be a valuable resource for academic and government institutions, professionals, new researchers and graduate students working in the application of nanomaterials in the aerospace industry. Qi-Long Yan is a postdoctoral research fellow at Tel Aviv University, Israel. He has previously worked as an Assistant Professor at Xi’an Modern Chemistry Research Institute, Xi’an, China. His research is on the investigation of energetic complexes based on carbon nanomaterials and used in solid propellants and high explosives. Guo-Qiang He is a Professor at Northwestern Polytechnical University, Xi-an, China, and Director of the Shaanxi Institute of Aeronautics. He is a member of the academic committee of the Chinese Hypersonic Technology Research and Development Center, and his research interests are aerospace propulsion applications, including rocket engine technology. Pei-Jin Liu is Professor and Vice-Dean of the School of Astronautics at Northwestern Polytechnical University, Xi-an, China. He has published two books on astronautic propulsion and combustion and conducts research on rocket propulsion, combustion diagnostics and instability. Michael Gozin is Associate Professor of Chemistry at Tel Aviv University, Israel. His research activity focuses on the preparation and characterization of novel nitrogen-rich materials for fire-extinguishing and other applications, preparation of new materials for therapy and biomedical imaging, and development of new chemosensors for forensic and other applications.